CAMP STRIKER, Iraq, Feb. 19, 2009 – Two deployed soldiers who served in the Vietnam War are serving again — this time in Iraq. Army Staff Sgt. Louis J. Swift and Army Chief Warrant Officer Steven M. Derry serve here with the 3-142nd Assault Helicopter Battalion, a National Guard unit from Ronkonkoma, N.Y. 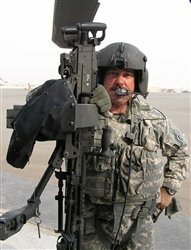 Swift serves as a crew chief and door gunner, jobs he has performed for the past 24 years. He is responsible for ensuring his assigned aircraft is safe by performing routine inspections prior to takeoff. This is Derry’s second tour in Iraq. He serves as the officer in charge of the battalion’s air movement request section. His job includes viewing flight schedules for battalion soldiers and ensuring they have adequate fuel and time to execute missions. The soldiers are quick to note the differences between serving in Iraq and Vietnam. Swift pointed out the changes he has seen in the force throughout the years. Although it was a different era, the Vietnam experience instilled values pertinent to today’s American soldier, Swift said. This will be the last tour for Swift and Derry, and while they are sad to see their careers come to an end, they said, they are proud to have served their country. Amazing! Thank YOU both for your service!